Deborah J. Ross: Tea, Earl Grey — Iced? In the cooler months, I often drink tea throughout the days, beginning with a eye-opening cuppa English or Irish Breakfast and proceeding through lower-caffeine green or white teas. I like flavored teas, as well: Earl Grey, Lady Grey, tropical green tea, blackberry sage. Most summer mornings I begin in the same fashion, but once it’s hot enough to make a steaming drink unappealing, what to do? Water is, of course, the default, and ours is delicious, even unfiltered. But sometimes I want a change. Lemonade is always an option, particularly when graced by the tree of a friend with fresh lemons. Often I’ll make hibiscus tea in a quart canning jar, sweeten it to taste, let it cool, and drink it right out of the jar. Today, however, I wanted something a bit classier. How about a variation on Captain Picard’s iconic “Tea, Earl Grey, hot”? I embarked upon the adventure by preparing a cup of Earl Grey, only using less water than usual, adding a bit more sweetness and milk* and then ice cubes. The result was both tasty and thirst-quenching. It came with the added benefit of that lingering, perfume-like bergamot aroma. 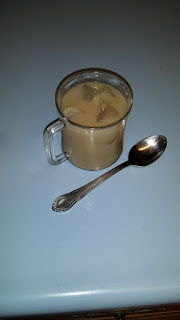 A second experiment might be to prepare it like Thai iced tea with cream instead of milk, although I am given to understand that sweetened condensed milk is often used, which is an abomination. My larder was devoid of cream, so I used 1% and my usual sweetener. Notes: * What? You put milk in Earl Grey tea? And you think sweetened condensed milk is an abomination! Well, yes. I put milk in all black teas. If your stomach lining was in the shape mine is, you’d want the added protection of milk protein. Not only that, I used to be meh about Earl Grey, considering it to be highly overrated, but once I put milk in it, tea-endophins flooded my mind. It might do the same for you. Sweetened condensed milk is a perfectly acceptable dessert recipe ingredient. Never shall it be introduced into a teacup on my premises. Should you feel otherwise, I await your report on its effect upon otherwise decent tea.